Amid the continuing advancement of technology and the further industrialization of the modern world, there are still slices of heaven left here on earth that have been untouched by science and the greedy hands of men. Before we lose these astounding and jaw-dropping sights to pollution, human settlement, and natural disasters, we should, at one point in our lives, visit these places if we have the chance. The natural world has more to offer us than social media or AI robots, and while technology is impressive, nature is unique, mysterious, and breathtaking. So here are six natural wonders for you to explore on your next vacation! Despite being a small country, Mauritius has no dearth of natural and man-made attractions. 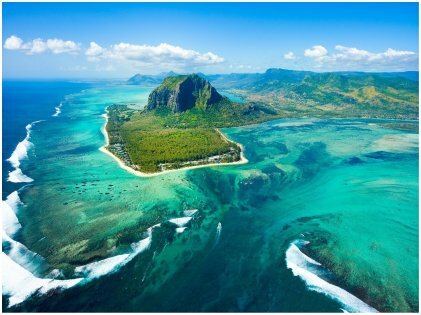 Paired with its rich cultural heritage, Mauritius is one of the most beautiful places to witness the bounty of nature. Among all the attractions that have been discovered, the one that stands out is the “underwater waterfalls”. However, scientists found out that what looked like a waterfall is actually sand from the seashore that was driven by ocean currents, and as the sand falls off the coastal cliffs into the deeper part of the ocean, it creates the illusion of a waterfall. You can find this place off the coast of Le Morne, and it’s definitely a unique attraction if you’re tired of scenic mountain views. 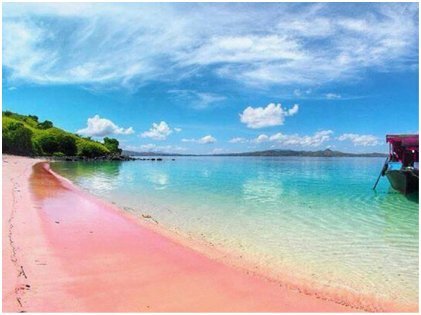 Yes, a beach with pink-colored sand! The lovely seashore of the Komodo Island in Indonesia has a pink sand beach thanks to a microorganism called Foraminifera. They produce a red pigmentation of the coral reefs, hence the light pink color of the shore. Komodo Island is pretty unique in itself for one more reason — it is home to the only living dragons in the world which makes it a big tourist attraction. Though cruising tours are quite expensive, the island still draws numerous tourists annually. 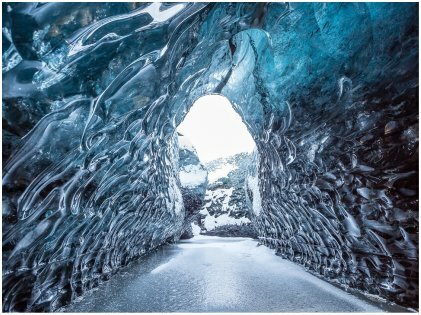 Ice and crystal – that’s what you get in the cave at Vatnajokull in Iceland. Vatnajokull happens to be the largest glacier in Europe and turns into a winter wonderland during the cold season. The various shades of blue are sure to mesmerize you. The glacier appeared in the 1985 James Bond movie A Time To Kill, and that global exposure has led to its appearance in various other films. The Crystal Cave is very popular among tourists who visit the country during winter to see it in its full glory. The unreal pictures look like it is a tunnel under the water, only it is ice and crystal. 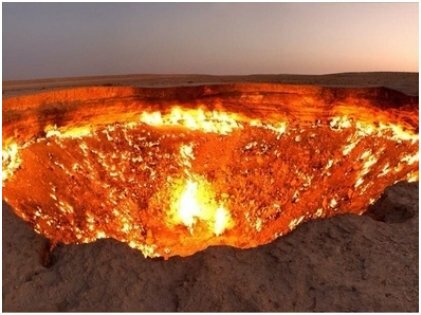 The Derweze Gas Crater in Turkmenistan is rightly named “Door To Hell”. But don’t let that nickname scare you. It is actually a natural gas field that fell into a cavern. To avoid the spreading of methane gas, geologists set it on fire. Hence it has been burning non-stop since 1971 and has become a big attraction for tourists from all over the world. It was the Soviet engineers who spotted it back in 1971. If they had not set it on fire, then the dangerous gas would have been lethal for all living beings nearby. An explorer named George Kourounis has set foot at the bottom of the cavern to collect samples of microorganisms, and many are still left undiscovered in this area of the world. No, you are not looking at a movie set from a dystopian movie. Deadvlei in Namibia is real and surprisingly beautiful, and the desert has a beauty of its own. It is a clay pan located in the salt pan of Sossusvlei. 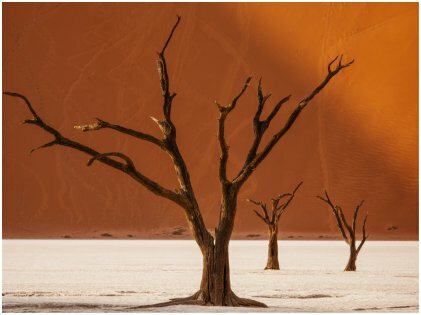 Deadvlei means “the dead marsh”. The sand dunes surrounding the vlei are the highest – almost 300 to 400 meters. The skeletons of the trees found here are 600 to 700 years old. The trees have turned black now because of sun exposure, and the entire place with those dead trees looks very dramatic. Often, we use the phrase “like a painting” for nature. 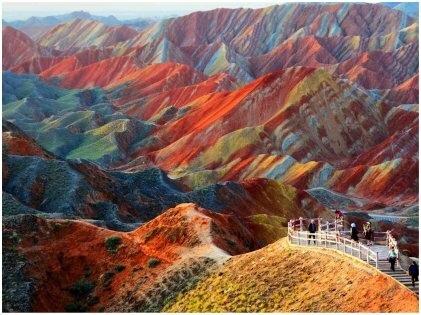 When you look at the mountains at Zhangye National Geopark, you will know that the phrase is perfect for this place. The mountains look like someone has painted them with multi-colored crayons. This place is voted as the most beautiful landscape in China and has become a global attraction now. Who needs to visit outer space when you have such otherworldly landscapes right here on earth? Or maybe looking at these places will make you yearn for interplanetary travel? Fret not as Elon Musk’s SpaceX has promised to take human beings to Mars by 2025, but until then, let the earth amaze you!